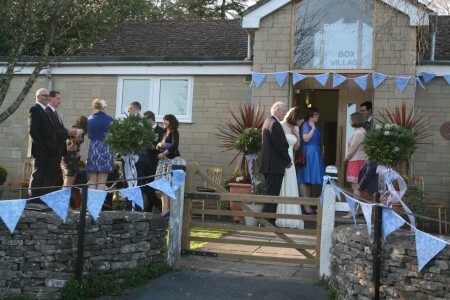 Box is very fortunate in having an exceptional Village Hall. Through the efforts and generous donations of many of the residents of the time, it was built in 1970 and has since been managed as a registered charity on behalf of the village by a group of volunteers who are also Trustees of the Hall. Major refurbishment of the Hall took place as a millennium project resulting in vastly improved kitchen and toilet facilities, larger storage areas and a face lift! Subsequent to that, work on a patio area to the side of the Hall has meant that summer coffee mornings, mother and toddler group and art group activities all take on a new dimension. 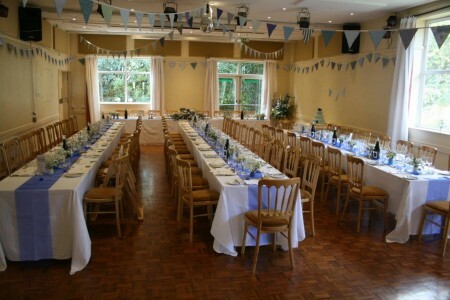 The Hall and all of its facilities are available for hire by residents and non-residents for a large variety of functions ranging from parties to dances and social events (all subject to the booking secretary’s approval). Click here to see the current booking schedule. Please note that the schedules are copies and therefore may not be completely up to date. They are offered only as a guide prior to requesting a booking. Hall hire charges for business users i.e. anyone who makes a charge for their services, whether resident in Box or not are: £12 per hour Monday to Friday, £16 per hour on Saturdays. For Box Residents the charge is £6.00 per hour any day (only for themselves, their family or Box events). For non-Box Residents the charge for Sunday to Friday is £12.00 per hour, and for Saturday it is £16.00 per hour. Please note that the booking fees are kept as low as possible on the understanding that all hirers make every reasonable attempt to clear up after their event, sweep floors and ensure the venue is fit for the next hirer.